The history surrounding Boringdon Hall is unlike any other hotel I've ever visited. Dating as far back as 959 AD, Boringdon Hall has had a truly Royal existence, with King Henry VIII eventually claiming it as Crown Property in 1539. Even its name isn't what it first appears (unlike my initial thoughts): 'Boringdon' has no etymological links to 'boring' and actually derives from the Saxon word 'Burth-Y-Don', meaning 'enchanted place on the hill'. And I can tell you that the Saxons hit the nail right on the head. As we approached the hotel's magnificent meandering driveway, I immediately understood what all the fuss was about and why this hotel had commanded Royal attention. Set amongst stunning, manicured grounds, a beautifully restored Grade 1 listed Tudor manor house stood proudly before me and waiting patiently at the entrance for our arrival was the Boringdon Concierge. After checking in, we were shown to our room (our bags kindly carried by the Concierge) and left to enjoy the hotel and its amenities. Downstairs you'll find the reception area, the Great Hall, the Mayflower Brasserie, event spaces, a corridor leading to the altra-modern Gaia Spa and a secret speakeasy bar. On the gallery overlooking the Great Hall, you'll find the Gallery Restaurant, the hotel's award-winning 3 AA rosette fine dining restaurant headed by Chef Scott Paton. First impressions registered and Boringdon Hall had stole my heart. Each room has been designed with opulence, heritage and comfort in mind (although there's no lift to the second floor for those less able to use the staircase). In the Grand Hall, lavish Tudor-esque chandeliers hang above a variety of Chesterfield sofas, while light is cast upon the rooms through enormous windows. Elsewhere, bookcases and historical paintings line the walls, while log fires crackle pleasantly throughout the building. Velvet, oak, leather and marble feature in almost every room and feelings of luxury, comfort and familiarity make it easy to switch off from the rest of the world. And with a total of 40 rooms and suites, you really can leave the rest of the world behind and enjoy a intimate, romantic getaway. If you're feeling really romantic, a room like ours complete with a four-poster bed and a freestanding bathtub (big enough for two, I might add) should make for a night to remember. Located upstairs overlooking the Gaia Spa, our room contained all of the modern amenities required in today's world, while bringing its own unique character to the party. 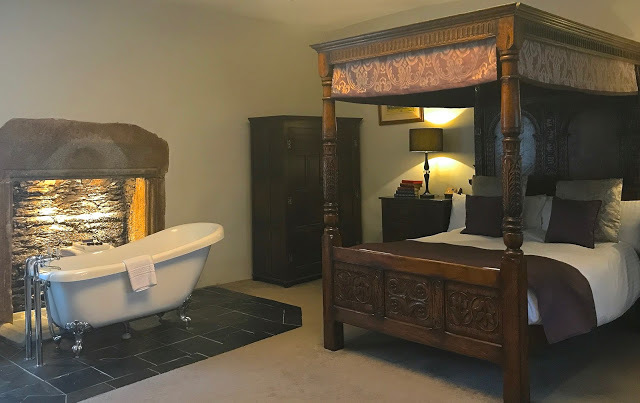 The antique wooden furniture, the remnants of an old fireplace and the huge, ornate double bed remain true to Boringdon's original Tudor style and sit well in the large open space, while the freestanding bathtub creates a welcome, contemporary juxtaposition atop a marble floor. In addition to having the bathtub in the bedroom, our room also housed a fully tiled, modern en-suite bathroom with a glass, walk-in shower, two fluffy robes, a hairdryer and lots of lovely ESPA toiletries. Of course, a romantic getaway isn't complete without a visit to a spa and the Gaia Spa at Boringdon Hall doesn't fall short. In fact, it's up there with the UK's best and most luxurious spas that I've had the pleasure to relax in. Inspired by Mother Nature, the spa's interior and exterior are made from natural materials including wood, stone and glass to help bring the outside in. The main spa area boasts a heated indoor swimming pool, hot stone beds, loungers, a hydrotherapy pool with an outdoor swim-through, experience showers, a traditional steam room, a Finnish sauna, a crystal salt steam room and a Laconium herbal sauna and during the warmer months, guests can enjoy the outdoor relaxation areas and hot tubs. Without a doubt, I could happily spend the rest of my life in the Gaia Spa as each area is expertly designed with comfort and wellness at the forefront of its intention. For those looking for a more active spa experience, the Gaia Spa is also home to a state-of-the-art gym featuring the latest cardiovascular and resistance equipment, free weights and separate changing areas. And for those looking for a more personalised wellness experience, the Gaia Spa offers treatments and therapies, including massages, facials and beauty treatments, to nourish the mind, body and soul. Exclusive to those having treatments, the deep relaxation room overlooking the wild flower meadow offers an inner sanctum of peace and serenity for the ultimate spa experience. 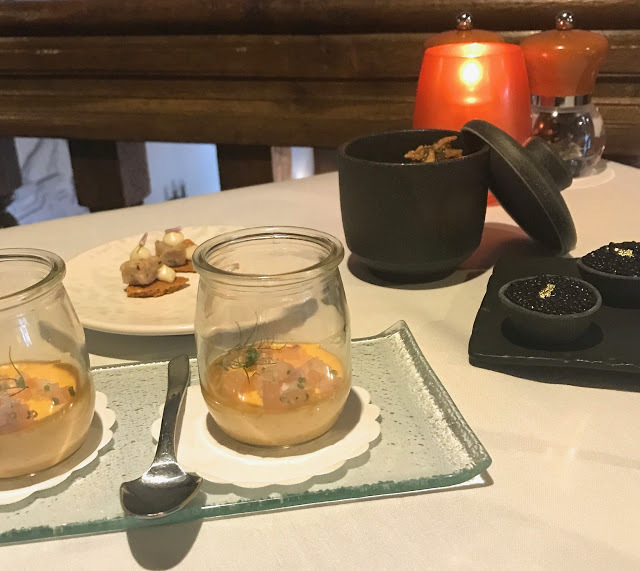 After a glorious afternoon of relaxation in the Gaia Spa, we headed to the Gallery Restaurant to sample their a la carte menu. The restaurant itself is intimate and charming, with immaculately pressed white table cloths lining each table and a cosy, romantic ambience. Once seated and after being plied with alcohol (a glass of Sancerre for a me and Malbec for Tom), we were treated to a complimentary selection of the Head Chef's amuse bouches, whose unique flavours and adorable presentation set the bar high for the evening. After the amuse bouches came the homemade bread and salted butter. Baked in-house daily, we chose from a selection of traditional and flavoured breads while we perused the menu. Whether ordering a la carte or from the 5-course tasting menu, the Gallery Restaurant menus change seasonally to showcase the finest of locally sourced ingredients and to create an unforgettable dining experience. For starters, I decided to go traditional and chose a beetroot and goat's cheese salad but this dish was unlike any other beetroot and goat's cheese dish I've ever been served. The presentation was absolutely stunning and the flavours were vibrant and clean, blending well together with each bite. Who knew beetroot could be so beautiful? For my main course, I opted for the fish of the day with sides of green beans and dauphinoise potatoes. Simple but delicious, I couldn't wait to try more of Chef Scott's creations. My final course of the evening was a deconstructed passionfruit cheesecake and it was so pretty, I didn't want to eat it. As a cheesecake connoisseur, I was slightly concerned that, although it looked beautiful, this contemporary construction wasn't going to live up to its more traditional sister's flavourings. But I had no need to be concerned; it blew my mind and we headed back to our four-poster bed feeling extremely satisfied. After a blissful night's sleep, we had enough time for a breakfast feast in the Gallery Restaurant before we needed to head back to London. Although it was a flying visit, there's no doubt in my mind that our stay at Boringdon Hall was one of the most memorable, romantic evenings I've had. Every element - from the welcome, the history, the decor, the four-poster room, the staff, the spa, the ambience, the food, the wine - was faultless and I would relive every moment again in a heartbeat. In typical British style, the only element against us was the weather; it rained so hard while we were in Plymouth yet the wetness only added to Boringdon's beauty. The house beamed, the gardens glistened and the history lived on. We said goodbye once but I'm sure we'll be seeing you again soon, Boringdon Hall.